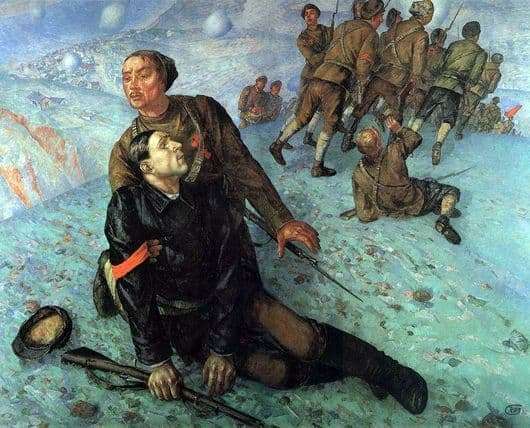 The artwork “Death of the Commissioner” took the first place in the Russian painting process of Kuzma Petrov-Vodkin. This creature contributed to an important picture with the plot “After the battle.” One of the leading for the artist was the content of life, sacrifice and death, which are clearly revealed in his masterpiece. More in depth, this topic is embodied in the film “Death of the Commissioner.” In the base of the episodes of creation, the artist included one of the inhuman battles of civilian wars. The commissioner was defeated in battle, his heavy body was lying on the hands of the Red Army man, the platoon of fighters continued their offensive. Based on the stability of the plot, the image of this scene goes beyond the boundaries of the precedent, pursuing the peak of philosophy and the conventionality of sounds. In this work, the artistic system of the creator, the extraordinary awareness of the colorful place and the color system are absolutely expressed. Concentrating on the leading group of colors, the artist reveals an important moment of the depth of space with distant villages, bends of hillocks with a blue river. The painter deviates from the classical direction. In the plane of the picture, the death of people occurs, at the same time focusing the viewer’s attention on the moment of the whole life. Heroic character is present in the picture, marked by the harsh tones of colors. It is not always possible to show the military direction, but Kuzma Sergeevich clearly convinces of the other side of the coin. It is not necessary to be in the center of events, you can express everything with feelings. People perceive multidimensional composite erection of a picture as a unity of plastic forms of realism. This contributes to the images found silhouette outlines, the central group of commanders associations are shown with inner anxiety and determination. Petrov – Vodkin made a masterpiece that most accurately met the standards of the time.